Announcement Laura Walker Jewellery features a range of quirky and charming personalized hand stamped jewellery and keepsakes. Working from my studio in SW France, my jewellery is designed for English and French customers. Many of the items can be customised with different wording, please contact if you have some special words, dates or even inspirational quotes that you would like to use. 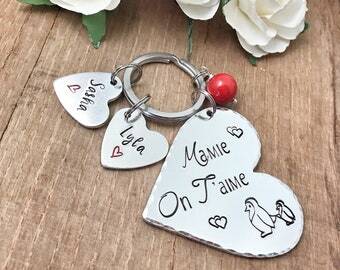 Laura Walker Jewellery features a range of quirky and charming personalized hand stamped jewellery and keepsakes. Bracelet magnifique, envoyé rapidement et avec le plus grand soin. Merci pour la personnalisation; je l'adore ! Fabulous! This is a gift for a friend and it is perfect. Arrived on time and well packaged. Lovely! J’ai envoyé un premier message à la boutique pour avoir un résumé de tous les médaillons possible pour chien. Laura m’a répondue très vite et j’ai craqué sur celui-ci. Il est arrivé dans la semaine ! Très résistant, original et personnalisable. Je l’adore et malgré le temps, les roulades dans la boue et la mer, il ne bouge pas ! Porte Clé Gravé à la Main. Idée Cadeau Papi!. Copper cuff, which can be personalized with your own text. Jonc en cuivre. Personnaliser avec votre texte. A love of pretty things has led to..... Laura Walker Jewellery. 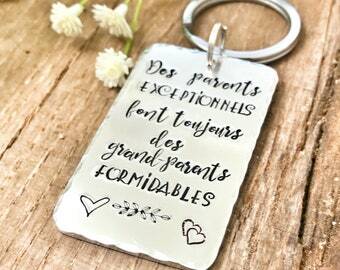 Working from my little studio, a converted outbuilding in our garden, in the Poitou-Charente region of France I create personalised hand stamped metal jewellery. I use individual steel stamps to create pieces using a variety of different metals. Each letter is individually stamped by hand onto a metal blank, which is then filed, oxidised and polished. Many of the items can be personalised if you have special dates, words that you would like me to use, making your gift truly unique. I have a huge selection of beads which can be used to add further customisation to your piece. Hand stamped jewellery is not meant to look perfect, very much like my hand writing!. Letters will not be in a totally straight line and the depth of each letter can often vary. All of this only adds to the charm of the item. Laura Walker Jewellery was created in 2005, throughout this time I have worked and experimented with various different styles of jewellery, my stamped metal jewellery being my very latest range. I thoroughly enjoy this latest 'craze' of mine, being able to personalise jewellery with special dates and words can be a very inspirational feeling!. Life has many milestones, treasure them and wear them daily. We have lived in rural France since 2009. My husband has his own plumbing and heating business, which is our 'proper' business and I assist with the daily administrative tasks. However my true passion (not including my 2 gorgeous young children) is my jewellery business. I find my only problem is never having enough time to 'create'...!!!. Thank you for visiting Laura Walker Jewellery. I hope you like what you see, but most importantly I want you to be happy with what you receive too. Please read all of the policies and additional information below, before placing your order. I want you to be happy with your purchase from me, if however for some reason you would like to return an item, you will have 30 days from date of order to do so. The item must be in the same unworn condition that you received it. It must also be in the original packaging. Earrings can not be returned due to hygiene reasons. A credit will automatically be applied to your credit/debit card or Paypal account, within 10 days. Custom orders cannot be returned unless the actual product is faulty. A photo of your custom piece will be sent to you prior to dispatch. Once your custom order has been agreed and paid for, it will be too late to make changes to product design etc. To return your item, you should post it to: Laura Walker Jewellery, 1 Impasse de la Margelle, Périgné, 79170, France. If you wish to exchange an item, please send an email to info [!at] laurawalkerjewellery.co.uk and send your item, including original packaging to the above address. Your new item will incur postage charges. I do strive for perfection with every piece of jewellery, however if an error has been made on my part, then a full refund, including postage costs will be issued. I guarantee items 21 days from date of purchase. Items that have been damaged through normal wear and tear by yourself, scratches etc cannot be replaced. You will have the option of paying by credit/debit card, Paypal or I will accept a cheque. However please note if paying by cheque jewellery will not be dispatched until funds have cleared in my account. I aim to dispatch general items within 1-3 working days. Custom items can possibly take up to 5 days to dispatch. Items are sent by the French postal service 'La Poste'. Items within France will be sent either 'Lettre Suivie' or 'Collisimo'. After your item has been dispatched I will send you your tracking reference. Items sent 'Lettre Suivie' have an estimated delivery of 2-3 days. Please note this is not a guaranteed timescale and can often take longer. Please select 'Colissimo' if requiring your item to be delivered within 48 hours. Items sent to other countries within the EU will be sent recorded delivery, please allow up to 5 working days for delivery. Countries outside of the EU please allow a minimum of 7 working days. LAURA WALKER JEWELLERY CANNOT BE HELD RESPONSIBLE FOR LATE DELIVERY OR LOSS OF YOUR ITEM BY THE POSTAL SERVICE. IF LOSS DOES OCCUR YOU WILL BE REIMBURSED IN FULL. Your item will be sent to the delivery address that you have stated when purchasing the item. Laura Walker Jewellery will not be held responsible if an item is not delivered or delivered to an incorrect address, if this is due to a customer inputting a false address. Stamped characters may not be in a totally uniform matter, this really only adds to the charm of the piece. Depth of characters may differ and is also part of the charm of a hand stamped piece of jewellery. Spacing between words may differ. Items purchased may vary slightly to those photographed as each item is unique. Stamping can often leave an imprint on the back of your piece of jewellery. This is not a flaw but is simply the metal displacing when stamped. Aluminium is a very light weight metal but extremely strong. It will scratch if care is not taken.